The whole family (including me) has been sick this past week which has resulted in some unexpected at-home-time for me. Those that know me know this can only have one outcome -- new projects. Here's Aja -- our newest addition to the family wearing one of her new sweaters. I'm not generally a fan of doggie clothes but she was just so darn cold outside during our numerous house-breaking expeditions to the back yard that something had to be done. As you can imagine -- she is no longer cold . . . These sweaters are amazingly easy to make. They are upcycled human sweaters. In their former lives, these were the sleeves of sweaters. I chopped off the sleeve, salvaged some yarn from the same sweater and whipstiched around the bottom. 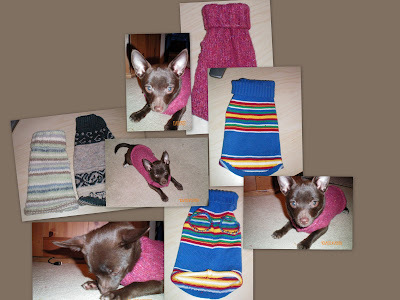 I cut two slits for leg holes and whip stitched around those as well and voila -- doggie sweaters!